The Flåm Railway is considered one of the most spectacular rail journeys in the world, as it winds its way between the mountain station at Myrdal (867 meters above sea level) and the fjordside village of Flåm in the inner reaches of the Aurlandsfjord; a branch of the famous Sognefjord. The construction of the rail line started in 1924, and was opened in 1940. It was built to facilitate access from the villages on the Sognefjord to the rail line between Oslo and Bergen. The rail line trajectory folows the Flåm valley and traverses numerous tunnels and bridges. A gradient of 5.5% makes it the steepest standard-gauge railway line in Europe. The stunning scenery and the steep mountain sides with tumbling waterfalls has made it one of the most visited attractions in Norway. The train runs all year allowing visitors to experience this fantastic fjord scenery in all seasons, although many of the facilities in the Flåm village close down over the darkest months of December and January. 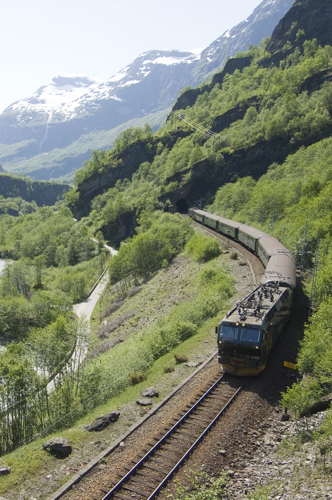 The Flåm Railway is an intergral part of the Norway in a Nutshell and the Sognefjord in a Nutshell (summer only) excursions, which can be enjoyed as a one-way trip from Oslo to Bergen or vice versa, or as a roundtrip Bergen to Bergen, Voss to Voss or Oslo to Oslo. 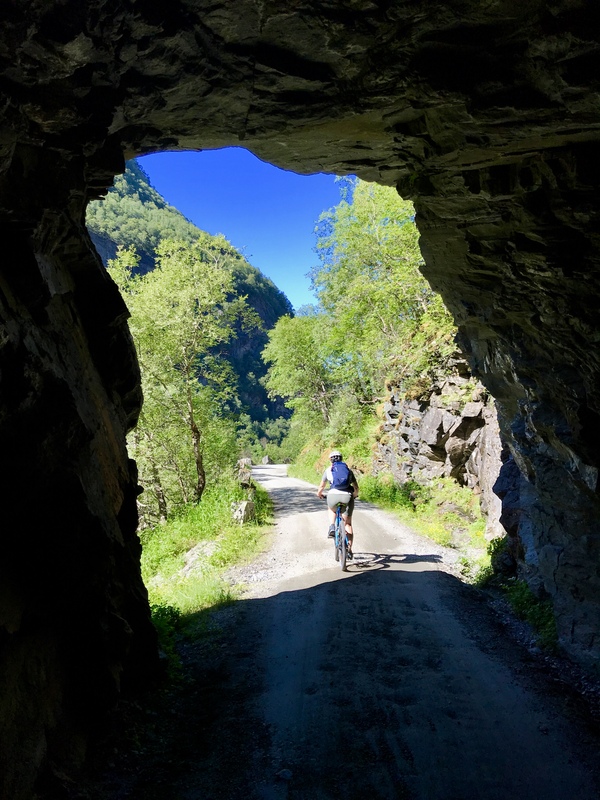 Although most people visiting Flåm chose to travel through the Flåm valley by rail; you can also enjoy the journey on foot or by bike. You can, for instance, pick up a bike in Flåm, and take this with you on the train from Myrdal and cycle back down. Please see our Norway in a Nutshell – Active trip for an alternative way to enjoy the region. 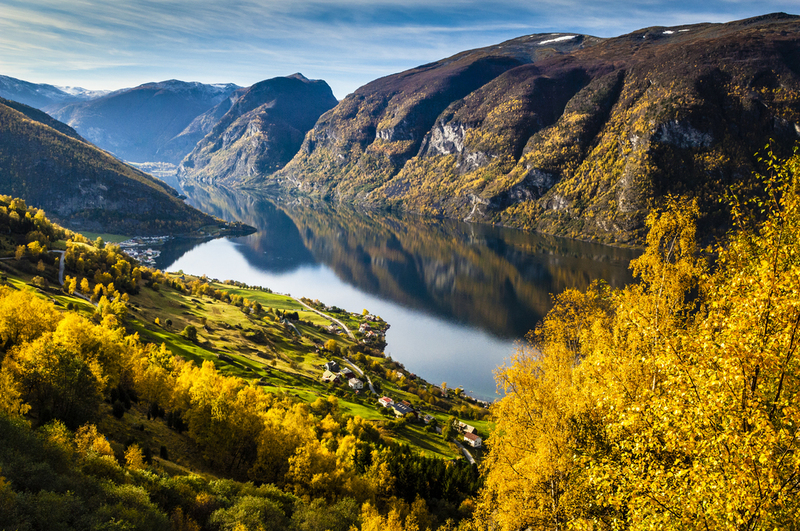 The picturesque village of Flåm itself also has a lot more to offer than just the Flåm Railway. There are numerous excursions on offer in the village, such as kayaking, RIB boat safaris, local walks and goats cheese tasting, just to mention a few. At 50 Degrees North we have spend time researching the area offering you tips and hint on the best way to enjoy the Flåm Railway, and the surrounding area. A well planned trip is essential if you want to be sure to avoid the main crowds, as Flåm hosts thousands of visitors during the busy summer months, June, July and August. Some of the worlds largest cruise ships also come in to dock in Flåm, and the village may then look more like a big tourist trap than a small picturesque Norwegian fjord village. So, do contact us at 50 Degrees North to make sure your trip is special.